Did you know that dogs don’t sweat? Because of this, they do not tolerate high temperatures as well as humans do. Dogs depend upon panting to exchange warm air for cool air. But when air temperature is close to body temperature, cooling by panting is not an efficient process. As a concerned citizen, it’s difficult to watch a dog exposed to the sweltering heat and not take action. The good news is that there are steps you can take. If you see an animal left inside a vehicle, check the hood to ensure that the car is not running. If the engine is off call local law enforcement immediately. Be sure you have the location address, license plate, a detailed description of the vehicle, and the location of the vehicle in the parking lot. If you are able, wait until help arrives in case the animal’s condition worsens. If you come across a dog with no shelter or water, report it! Complaints to the Greater Birmingham Humane Society’s cruelty hotline remain completely confidential. A representative from GBHS will go to the location and offer assistance when needed. We receive donated doghouses periodically and provide them to dogs in need in our own community. A dog should never have to live exposed to the elements and without their basic needs met. That’s where we come in! If you or someone you know has a doghouse that is no longer in use, bring it to our shelter at 300 Snow Dr., Homewood or call us to pick it up. Often there are advertisements for used doghouses in the newspaper or online. These donations are tax deductible based on the price you paid for the item, and you’re helping future dogs in need from suffering in extreme temperatures. We want your pets to be safe, healthy and happy. 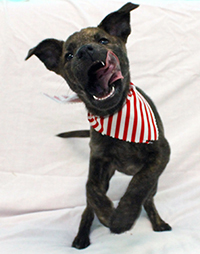 GBHS reaches fundraising goal during 2014 Barking for Bucks telethon! On August 2nd and 3rd, the GBHS held its 5th annual telethon to raise money to help care for our homeless pets. The event was broadcast LIVE from our adoption center onWBRC Fox 6 and featured local celebrities, adoptable pets, and the GBHS mascots. Thanks to the generosity anf kindess of our community and friends, we were able to raise $72,172, exceeding the $70,000 fundraising goal. The gifts provided to GBHS during the telethon will be used to further the mission and operations of our facility and programs. Don’t just take your dog for a walk… Take your Walk for a Dog! 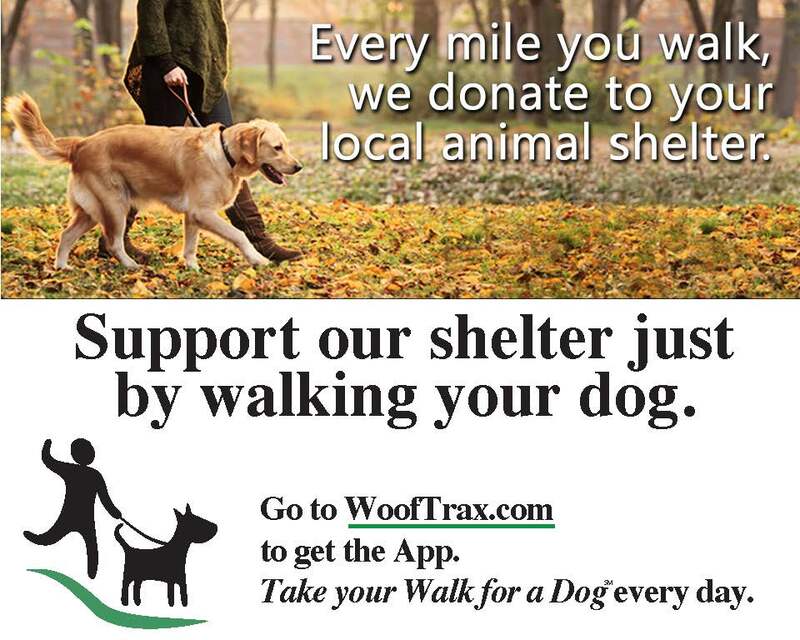 Go to WoofTrax.com, download the app, and support your local animal shelter every time you walk your dog. 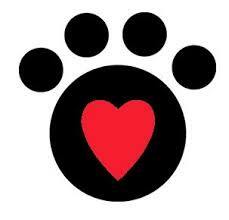 The Walk for a Dog program is a revolutionary dog-powered fundraising tool for animal shelters. Support the Greater Birmingham Humane Society simply by walking your dog! Download the app on your phone (available for both Android and iPhones) and use it each time you grab for the leash. You can add the GBHS as the shelter you are walking for in the setup menu of the app. You can support our shelter every time you shop online! 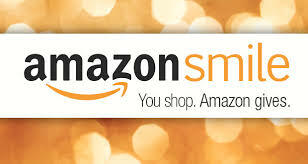 AmazonSmile connects with your existing Amazon account, and the AmazonSmile Foundation will donate 0.5% of the purchase price from your eligible AmazonSmile purchases. Join the Greater Birmingham Humane Society for a family fun day, Sat., Aug. 2! Join us from 9 a.m. to 2 p.m. for a free community festival event. The event will include music, food, children’s activities, face painting, pet photos, animal rescue partners, pet supply vendors and more! We are looking forward to having these great groups join us! Local pets that have been adopted through the GBHS are invited to reunite with the GBHS staff and volunteers for a fun weekend. We want to introduce the newest members of the GBHS family. Penny – who lives at the adoption center – had 6 puppies! We love it when tiny paws come into the world, but our facility is not the best environment for a new mom dog and her pups because it’s crowded and noisy. These future pets need a quiet, calm environment during the next few weeks. At times like this, our need for foster parents goes from great to urgent. So, what’s up with this foster program? The GBHS Foster Parents provide short-term homes for kittens, puppies, dogs and cats who need need a little extra TLC before they can be adopted. Your spare bedroom or bathroom could be put to use giving puppies or kittens somewhere to grow for two to three weeks, or you could give a dog undergoing heart worm treatment somewhere soft to lay down at night for just a few short months. By offering your time, love and attention, you prepare your foster dog or puppy for adoption into a permanent, loving home. Opening your heart and home to a pet in need is one of the most rewarding ways to make a difference. All you need is a small space and a lot of love—we supply everything else. Foster Parents are required to attend a brief orientation session and must have all other pets in their home up to date on shots and spayed or neutered prior to having a GBHS pet placed with them. If you are able to fill this need, please contact Stella Burton, gbhsfoster@gmail.com. 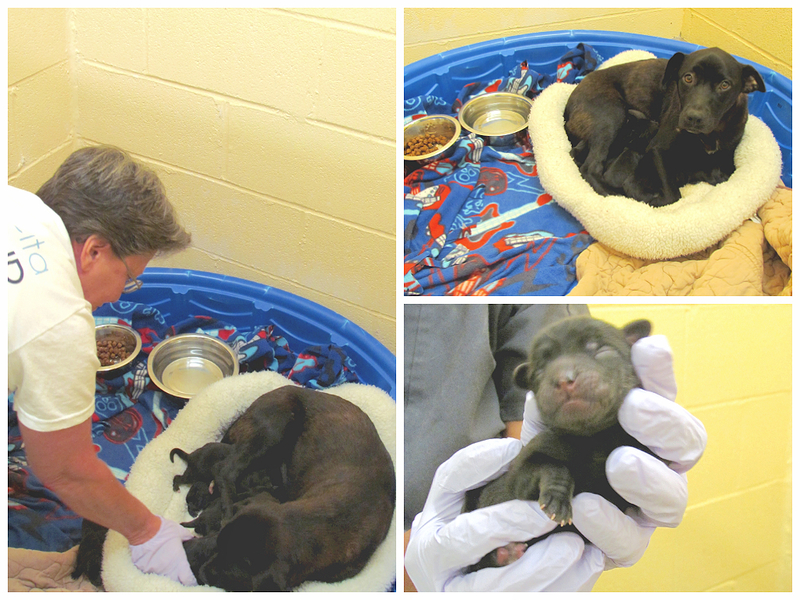 For more information on Penny, her pups, or our foster program, please call (205) 942-1211. Be part of the GBHS Barking for Bucks fundraiser! 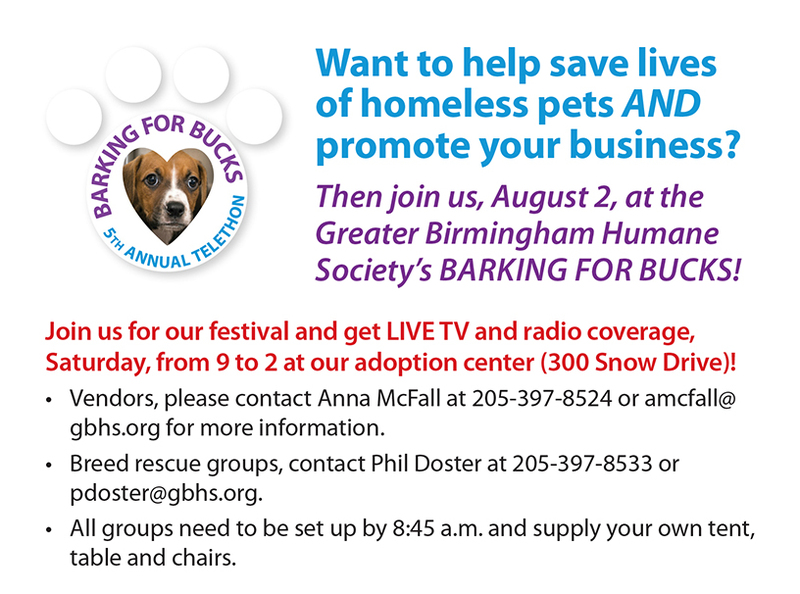 Support the Greater Birmingham Humane Society’s commitment to our communities with a donation made through the Barking for Bucks campaign, a live telethon fundraising event. The annual “Barking for Bucks” telethon will take place from 7 to 9 a.m. the weekend of Aug. 2-3 at the GBHS Adoption Center, located on Snow Drive in Homewood. Hosted live by local television talent Mickey Ferguson and Jeh-Jeh Pruitt, the telethon will feature adoptable pets, local celebrities and live interviews. This family event is a great way to learn about the many programs provided by the GBHS and to see the positive impact the organization is making on the community and animals. In conjunction with the Barking for Bucks telethon, GBHS is hosting a family fun day Saturday, Aug. 2. Join us from 9 a.m. to 2 p.m. for a free community festival event. The event will include food trucks, children’s activities and pet supply vendors. Local pets that have been adopted through the GBHS are invited to reunite with the facility and staff for a fun weekend. In 2013, the telethon event raised more than $73,000 and received donations from 830 individuals. All proceeds from the telethon directly support the mission and operations of the GBHS. Corporate sponsorship opportunities are available for the televised event. Vendors and friends are invited to set up a table to promote your organization or business at no cost. Booth set up begins at 9:45 a.m. and the community festival will be held from 11 a.m. to 2 p.m., Saturday, Aug. 2. Interested in being a vendor? Email amcfall@gbhs.org or call (205) 397-8524 to confirm your spot! For over 130 years, Greater Birmingham Humane Society has been promoting respect for life through education and prevention of cruelty to animals and people. Dixie’s Group will meet Tuesday, July 15 at 5:30 p.m. at Homewood Library. Please contact Randy Hayes at (205) 542-7111. If you’ve struggled with losing a pet in the past year, we invite you to join Dixie’s Group. This is a weekly meeting program dedicated to helping people through the process of losing a beloved pet. The group will be lead by Dr. Larry Michael, an experienced grief coach who understands the impact of loss. He served as a pastor for over thirty years, and more recently served as director of a local grief agency. In addition to helping individuals who have lost loved ones, he is a pet lover and has a desire to help those who are grieving the loss of a pet. Dixie’s group will be a six-week program that meets on Tuesday nights from 5:30 p.m.-7:00 p.m., at the Homewood Library. The group is open to those who have lost a pet in the past year. To register, call Randy Hayes at 205-542-7111. There is a $25 fee for the four sessions. In order to properly serve attendees, space is limited to 15 participants at this time. I received a phone call from Randy a few weeks ago. He said his sweet yellow lab, Dixie, had recently passed away. He searched the area for a grief support group, and when he couldn’t find anything in Greater Birmingham, he contacted us and volunteered to help get the ball rolling. In loving memory of the pet who inspired this program, we have named it Dixie’s Group. When: Tuesdays, 5:30 p.m.-7:00 p.m.
Did you know it is illegal to leave an animal alone in a car in Hoover, Alabama? Phil Doster, director of operations at the GBHS, and our friends at the Grants Mill Animal Hospital tell al.com reporter Joey Kennedy that leaving animals alone in a vehicle can be a deadly mistake anytime, but especially this time of year. “The inside of a car can be 20 to 30 degrees or more hotter than the air temperature. Do the math. 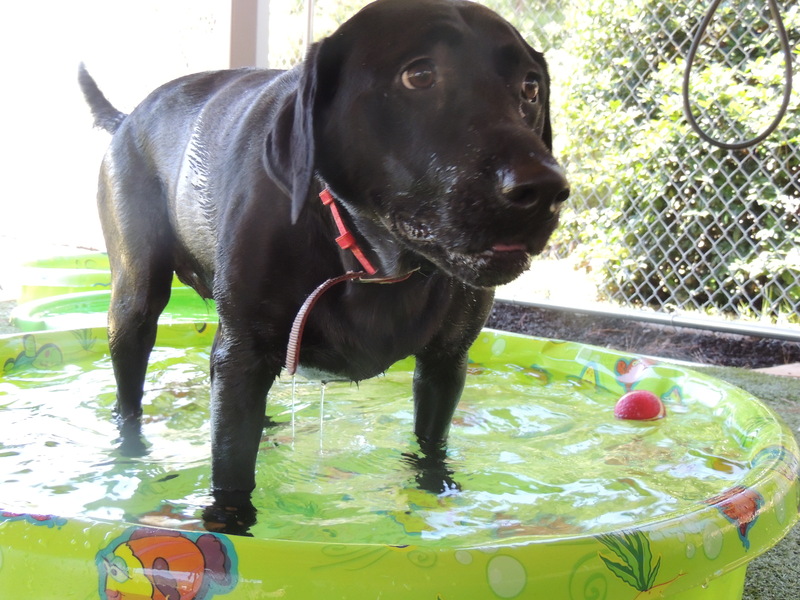 As our temps get closer to 100 degrees, we’re talking 10 or 15 minutes for a dog to suffer from heat stroke,” said Dr. Lindsey Petras, owner of Grants Mill Animal Hospital. Even with the heat warnings and pet care education, it is common for people to leave pets unattended, even for brief periods of time. For those like Petras and Doster, this is cause for action. What should you do if you see a pet locked in a hot car? The article states it’s against the law to leave an animal in an automobile alone, at any time of year, and maybe that’s an ordinance that should be adopted by other municipalities. Then, at least, there would be more justification for a forced entry into a car containing an unaccompanied canine. What do you think? Read the full article by Joey Kennedy here. BBQ wants you to have a safe and happy Independence Day! Ensure your pet is wearing proper identification tags that list their name, your name, home address and phone number. Loud fireworks scare many animals, and festivities including visits from friends and family can often create extra distractions for pet parents. It’s best to make plans for your pet before guests arrive. If your dog is anxious, consider keeping them in a quiet but cool room indoors and make it a point to check on them regularly. Keep matches, citronella candles, bug sprays, sunscreens and lighter fluid out of your pet’s reach. These products can all cause serious health problems for animals. It’s not a good idea to give your dog (or your kids for that matter) free roam of the yard when the grill is on. Burns can happen in an instant. Never leave alcoholic drinks unattended where pets can reach them. Alcoholic beverages have the potential to poison pets. Brush up on your dog’s training. Your dog should have basic obedience training, and should easily respond to you. Have questions? Contact the Greater Birmingham Humane Society at (205) 942-1211 for more information. To report animal cruelty, please call your local Police Department. The Greater Birmingham Humane Society’s mission is to promote the humane treatment of animals and people through education, advocacy, and services. Dogs, lawyers and artists, oh my! This Thursday, March 13, we get to be a part of two cool events–both are at schools and both will feature adoptable dogs! Rascal Day is held each year at Cumberland School of Law, located on campus at Samford University. Rascal Day has been a part of Cumberland’s Law Week for many years. Photo courtesy of Cumberland School of Law. We were invited to celebrate the life of Rascal and this fun tradition with the students at Cumberland. We hope you’ll join us from 11 a.m.-1 p.m. at Samford University. We’ll have adoptable dogs with us, too! McAdory Elementary School art teacher Shelly Bailey contacted us this past fall. She said that her second grade students had been learning about pet care, and she wanted to do a corresponding art lesson. She had the almost 200 students draw pictures of pets and then delivered the artwork to the GBHS to get a very special “paw-tograph” on each drawing. Wall-E had been at the adoption center for a quite a while, but he made the perfect candidate to stamp his big paw on each child’s artwork while getting lots of love and encouragement from GBHS staff. Here we are, many months later, and the artwork is ready to be sold with proceeds benefitting the GBHS. Come join us and the McAdory students at their school on March 13, from 6 p.m.-8 p.m. at the art show. We’ll be there with our mobile adoption unit, TARA, and adoptable dogs. Wall-E and staff hard at work to “paw-tograph” almost 200 pieces of artwork. Wall-E left his mark on the students’ artwork. Wall-E definitely needed a bath after stamping all that artwork. You can see all our adoptable pets here.